I ordered new work boots online from Amazon on Sunday, the 24th, and the boots were delivered today, Wednesday, the 27th. Fast, huh. I decided to shell out an extra $9 for the next faster delivery option above free delivery. Oh, I almost forgot to mention a minor detail, I was informed of the delivery by FedEx through Email, and also that I wasn't at home during the delivery attempt, but oddly the delivery person didn't leave a message on my phone, so how in tarnation would I be aware that the FedEx delivery person was downstairs attempting an attempted delivery if they simply neglect to ring me up on the apartment building phone. My ring-up number on the apartment building's phone is the same number as my cellphone, so I would have, at least, a "missed call," on my cellphone's history page, even if the phone was off where ever on the island I happened to be even ruling out other phenomenon. There is no record of a FedEx call whatsoever. Perhaps, the delivery person came all the way to the lobby door but got cold feet crossing the threshold. This kind delivery screw-ups fall under "final mile" blunders. You can get merchandise delivered to your city from an online retailer located thousands of miles from your address, but the final mile, why that might take a while. Thusly, I arranged to pick-up the boots myself at the nearest FedEx holding station, or whatever those points are called. 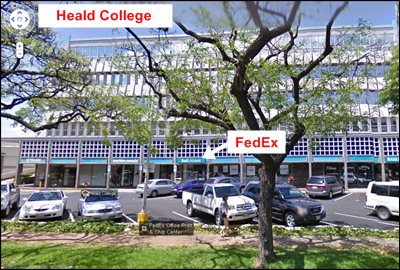 Mines is on Kapiolani Blvd., the next building to Walgreens in the Heald College building just across the street from Nordstroms at Ala Moana. The drop off station is suppose to Email me when my work boots are available for pick-up. Let's see the new boots! Nate- my feet were aching so bad, I almost threw my other work boots into the Ala Wai canal after I got home. They were meant for a different type of physical activity, so it's not the boots fault. My feet weren't hurting on the bottom of soles. The ache was on the top surface of my feet where the steel toe bends with every step. The more your feet remained swollen from the previous day, the tighter the bend the next day, at one point, for 12-hours walking on gravel. Do not want a repeat of that experience, ever. That is too too aggravating, Ron! It's especially irritating because you paid for that expedited delivery. Sheesh! Kay- well yes and no. It wasn't the most expedited rate, but ordered Sun night, arrived Wed .... for $9. Can't beat Amazon for shipping rates, bar none. Of course it'll save me a ride over to the FedEx store if the delivery person did a better job, but then it saves me from waiting around all day for a delivery, and the holding store is openned at night. 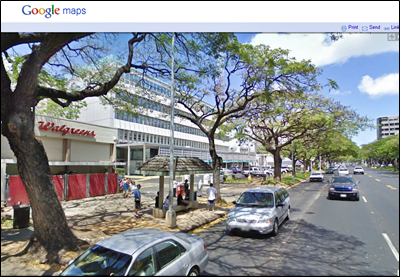 Btw, those photos were clipped from Google Map's "street view." If you've never tried it, you're able to drive virtually around the entire metropolitan Honolulu, perhaps even "drive" around your neighborhood.